We have published lots of interesting arduino projects like GSM based Fire Alarm System , Line Following Robot, RFID Based Access Control System and many other useful projects. 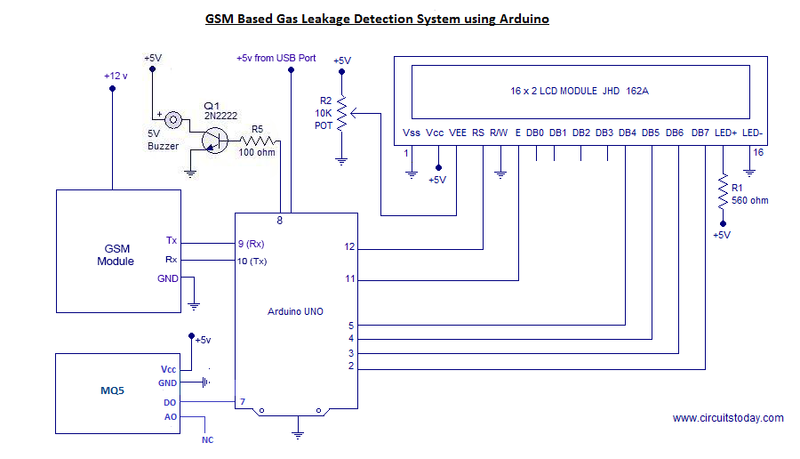 This time, we are publishing a highly useful home application – Gas Leakage Detector using Arduino and GSM Module with SMS Alert and Sound Alarm. 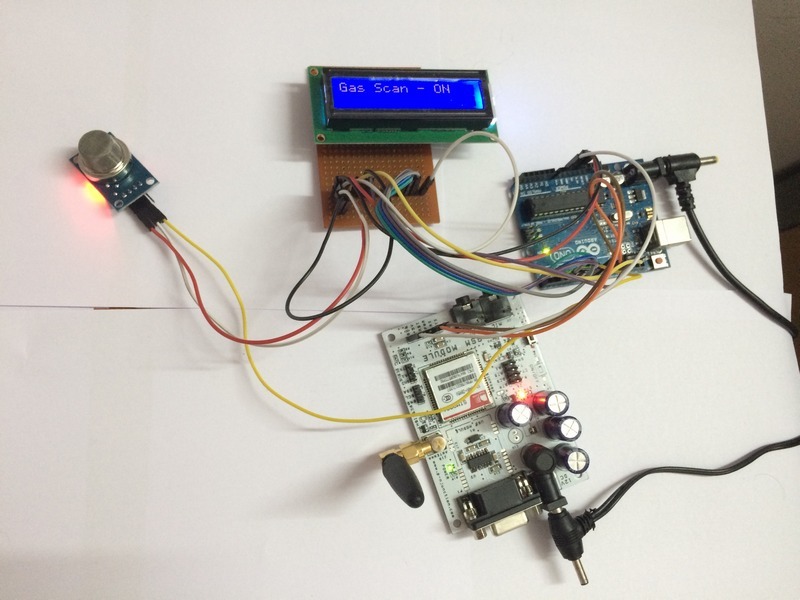 Â We have published an LPG Â Sensor Project using Arduino and MQ2 sensor before – which senses lpg leak and produces sound alarm. The project also has a relay system which turns ON or OFF a particular device upon gas leak (say we can turn the main electrical supply OFF upon gas leak to prevent fire). Detect Gas Leakage (like LPG leak, Butane leak, Methane leak) or any such petroleum based gaseous substance that can be detected using MQ5 Sensor. Display status in an LCD using a 16×2 LCD module. 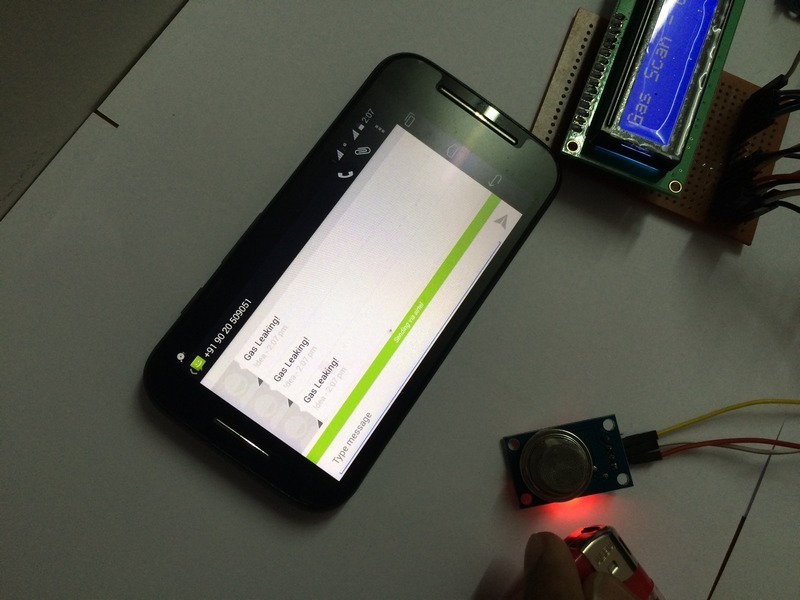 Lets begin to build our project – Gas/LPG leakage detector with SMS Alert and Sound Alarm!. I recommend you read the following tutorials before building this project! 1. Interfacing MQ5 Sensor to Arduino – teaches you how to interface MQ5 LPG sensor to Arduino and read values using analog or digital out pins of the MQ5 module. 2. Interfacing GSM Module to Arduino – teaches you how to interface a GSM module to Arduino and send/receive text messages using AT Commands. Assemble the circuit as shown in diagram! Important connections are explained below.A photograph of the assembled circuit is shown below. Note:- The speaker is not shown in this photograph. Anyway you can wire the speaker as shown in circuit diagram and connect it to pin 8 of arduino. When we develop critical systems like Gas Leakage Detector or similar systems like Fire Alarm System, we need to monitor the sensor parameters continuously(24×7). So our system must monitor “gas leak” continuously.This is achieved by scanning the sensor output (digital out of MQ5) continuously inside the ScanGasLevel() subroutine. If you look into the program, the main function loop() has only two subroutines – CheckGas() and CheckShutDown() – which are called repeatedly. CheckGas() – is a subroutine which scans sensor output continuously and take actions if there occurs a ‘gas leak’ at any point of time. Â CheckShutDown() – is a subroutine to monitor the shut down process and check if status of room is back to normal conditions (no gas leaking). CheckGas() â€“ is the function which monitors occurrence of a gas leak 24Ã—7.Â This function fetches the gas level measured by MQ35 (by reading digital out of MQ35 using digitalRead() command) and stores it to the variable Gas_alert_val for comparison. If there is no ‘gas leak’ – the sensor out will be HIGH. If there occurs a ‘gas leak’ at any point of time, the sensor out will immediately change to LOW status. The statement Â if(Gas_alert_val==LOW) checks this and if a gas leak occurs, then an inner subroutine SetAlert() will be invoked. Â SetAlert() is the function that controls number of SMS alerts sent to each mobile number loaded in the program. The number of SMS alerts sent can be altered by changing the stopping condition of while loop. The stopping condition sms_count<3 â€“ means 3 SMS alerts will be sent to each mobile number. If you want to send 5 alerts, just change the stopping condition to sms_count<5 â€“ you got it ?Â The function to send SMS (using AT Commands) â€“ SendTextMessage() will be called 3 times if SMS alert count is 3. This function SendTextMessage() will be invoked as many times as the number SMS alerts set in the program. In addition to sending SMS alerts, this subroutine also controls the sound alarm. The alarm is invoked using command digitalWrite(speaker,HIGH) – which will activate the speaker connected at pin 8 of arduino. Note:- We have limited the number of SMS alerts using the stopping condition. Once a gas leakÂ occurs and the set number of SMS alerts has been sent, the system will not send any more SMS! The system assumes that its job is over by sending SMS. Humans has to come and shut down the gas leak problem. After sending alerts, the system will start monitoring Shut Down process. Once the gas leak has been eliminated, system will automatically reactivate its SMS alert settings by resetting the sms_count variable back to zero. The output after applying ‘gas leak’ is shown in photograph! Here is a video demonstration of the output! CheckShutDown() â€“ is the function which monitors if gas leak was shut down. We need to entertain this function only if a ‘gas leak’ has occurred. To limit the entry to the statements inside this routine, we have introduced a variableÂ Gas_Leak_Status. This variable value will be set to value 1 when a gas leak occurs (check the statement inside SetAlert()). The statements inside CheckShutDown() willÂ be executed only if the value of Gas_Leak_Status==1. (If there was no gas leak occurred, we donâ€™t need to waste time executing ShutDown checking statements). We consider the ‘gas leak’ has been eliminated once room temperature is back to normal. So if our variable Gas_shut_val falls back to HIGH status, we consider gas leak has been eliminated and surroundings are safe. The subroutine has statement to stop the gas leakage alarm (refer statement – digitalWrite(speaker,LOW) – which cuts the supply to pin 8 of arduino and stops the sound alarm) which will be executed when gas leak is eliminated completely (as the status of Gas_shut_val == HIGH). We start our Gas Leakage monitoring again with SMS Alerts active! (We reset the Gas_Leak_StatusÂ variable and sms_count variable back to zero â€“ which are essential variable conditions for monitoring gas leak again and to send alert sms if gas leak repeats. Here is a slideshare presentation of the project! What if I donâ€™t use the LCD but I used arduino uno, mq5, gsm module sim900 and buzzer. Is it possible to get sms from the gsm module? Or should use some othe coding? Sir,i put buzzer as per the circuit diagram but it is allways giving sound without sensing any gas.How to rectify the problem.Is there any problem in programme code.please send me sir. hello sir the project is very nice please sir i wish to find out if it is possible to replace the arduino with a pic16f microcontrolle, if yes then please how do i go about? can i use gsm sim900A? what does 9600 mean in this line? Sketch uses 4892 bytes (15%) of program storage space. Maximum is 32256 bytes. Global variables use 489 bytes (23%) of dynamic memory, leaving 1559 bytes for local variables. Maximum is 2048 bytes. This is marvelous! no more fire out break as a result of cooking gas leakage at home! Weldone Adnin. I need to work on a scrolling dotmatrix of 160×16 using atduino, can you help me with the project sir? What should I do to the program if I don’t want to include an lcd display? This circuit can be connected using 9v battery. hello, my project is same like you but i use arduino and send notifications through telegram. Do you have any coding of arduino that can connect to telegram? jojo I used MQ 9, but it doesn’t not responding. screen always shows no gas leakage. then, I used MQ 5, it is also same. please give me a suggestion. my project working but I hv not received sms so can u help me? jojo, I am following your project steps. it’s helpful. jojo I want to add solenoid valve to control the gas supply also. so, what will be the change in this code? can you help me? Is this program valid for arduino uno? Yes. The circuit and code is developed using Arduino Uno. how can we control a device by using this project? like turning off the device which is suspected for gas leakage. all the 5v supply we connect on the in 5v at arduino right? Can i connect more than one sensor parallely? How is it possible?? Yes. You can. Use the free pins of Arduino. all the program/coding…i upload in the arduino? very helpful and easily understand by any person who is new to projects . I am also doing the same project sir but i need u to help me out pls I want a prg for automatic gas booking along with gas lekg detcr. where should i get report of this project..??? please help me in knowing how to upload the code ARDUINO and could you HELP in letting me know the components names used here sir. As i’m very much interested in doing this project. and yeah how to upload the programme THE APPLICATION USED TO do it. I tried this, worked beautifully. I also added a solneoid valve for automatic shutoff, just replacing the buzzer with the valve. Thanks a bunch! How do i modify this code to use analog out of the gas sensor then display the gas values in real time on the lcd then finally when there is a gas leakage it turns on an exhaust fan as well as the speaker and sms? Hi there! I’m interested in doing this project, and if you already answered this I might’ve missed it, but what programming application did you use to write/run your code so that the arduino would execute it? Hello… please I tried implementing this project but the SMS received is infinite. It give an infinite SMS. Please how can I stop that. In my case I need just one alert SMS at a time. i have tried this using my mq6 module, but my module is not heating up to apply gas, Help me with this please…. can this project combined with gsm based fire alert system arduino project? as I need to come with need idea for my final year project. Sir I an interested in this project but I want to use Unipolar Stepper Motor too with ULN2003A driver. So I want when the gas leakage is detected then the Stepper Motor rotates 180 degree in anticlockwise direction to OFF the gas regulator. So Sir I need programming for Stepper motor too that fulfill my above requirements. Plz reply! Sir can I use Sim-900A or Sim-900D GSM module instead of Sim-900 because Sim-900 GSM module is not available in my country. And if I use Sim-900A or Sim-900D GSM module instead of Sim-900 then I have to change the code also or it remains the same for Sim-900A and Sim-900D module? Plz reply! Thank you! hello..this mini project its sale?can i buy this because i dont know how to make it..please email me. how do i merge temperature sensor code with smoke detector code? it s very intersting project for home safety. 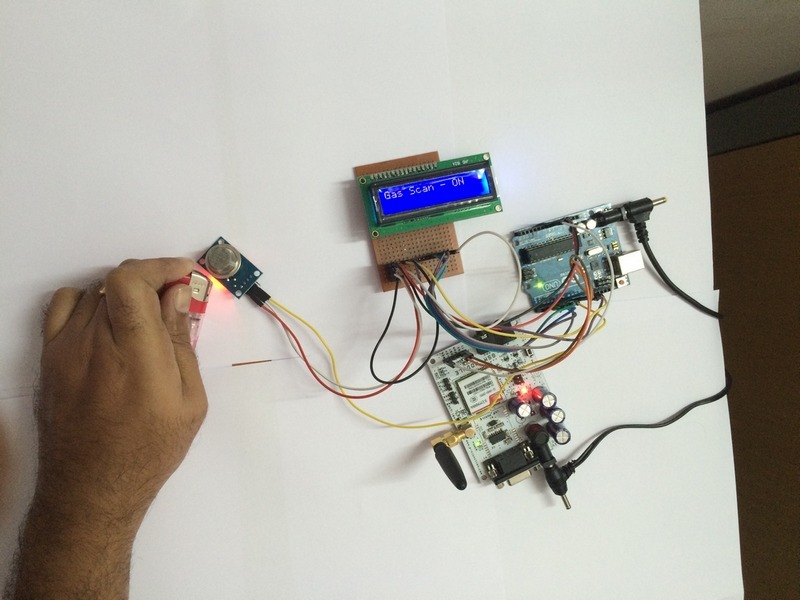 @Ramesh – hope you tried this gas leakage detector project using arduino! Thanks for the feedback. is it workingâ€¦â€¦.? if i add LED at pin 8 then without sensing LPG it is glowingâ€¦â€¦.can u please tell how it is workingâ€¦â€¦.please send me the detail…. There is not much difference in code when you are using Digital Out of MQ2! You can easily do it yourself by modifying this code! is it working…….? if i add LED at pin 8 then without sensing LPG it is glowing…….can u please tell how it is working…….